OmniStar Affiliate software (brought to market by OSI Affiliate) is a great software package that makes it easy to set up and manage a successful and profitable affiliate marketing program. With a range of great tools and features intended to make even the most complicated affiliate management task more straightforward, OmniStar Affiliate is already trusted by more than 14,000 businesses – including a number of major brands such as Cisco, Macy’s and a number of universities. 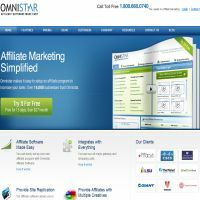 OmniStar Affiliate is also one of the more affordable solutions we have reviewed in this category, so it’s perfect if you’re looking for a solution that’s flexible and scalable, whilst also being easy on the bottom line. In terms of features, OmniStar Affiliate software comes well equipped. Users can use detailed reporting and analytics tools to help managers and affiliates alike make key decisions about the future of the program. All affiliate partners using OmniStar also have their own control panel, allowing them to monitor and manage their conversions and commissions and make chances to their accounts with ease. Managers can set up customizable commission structures to reward their affiliates and have the option to build additional rewards into the commission structure for the most successful affiliates. The easy to use OmniStar Affiliate interface makes getting the most out of the software simple and straightforward. What’s more, OmniStar has been designed to allow customers to integrate the software with their existing operations. Existing integration partners include Spotify, MailChimp, iPhone and more, although OSI note that most major shopping cart, merchant, gateway, billing or e-commerce software or programs should be easy to integrate with OmniStar Affiliate software. Most importantly, OmniStar Affiliate is a scalable solution – meaning as your business grows, the software has the capacity to grow with you, so you don’t have to change provider as soon as you start making money! One of the great things about OmniStar Affiliate is the wide range of additional features and complementary extras that are freely available to users of the software. They can access premium affiliate marketing e-books to find out more about the best ways to improve revenue and sales; obtain discounts on software from partner sites that OSI have selected as being particularly useful for users in this market and benefit from great support by phone, as well as a number of ‘how to’ videos. All of this makes OmniStar a great choice for those who are looking for more than just tracking software – the tools and extras on offer here really help your business to grow. We enjoyed checking out what OmniStar Affiliate had to offer. With a range of great features intended to support new and experienced affiliates alike and a number of packages that suit a range of budgets (although all are pretty affordable in our opinion), we can see why this software is so popular. If you’re interested in giving OmniStar Affiliate a try, hit the link below to sign up for your free trial today!